Ah, if only everyone in the world followed this wisdom. PS: I'm over at Thoughts in Progress today, talking about Southern comfort foods. Come on by and say hi! PPS: My newsletter launched this morning, so if you're signed up and didn't receive it, please check your spam boxes. I enjoyed your newsletter, but then I enjoy just about everything that you write. Off to Thoughts in Progress I go. Love this. The world would be a lot nicer place if we all tried to follow it. I agree. Seems so simple. I received your newsletter this morning, that and my first cup of coffee lighten my day! Thank You! I cannot wait to get your next book. God Bless You and Your Muses! Thank you for the newsletter! And it is true that there is no one we agree with 100% of the time. I love the picture. Thank you. I was so happy to find your newsletter in my emails this morning! Love your books! Those are very wise words above. My parents raised me with that ideal, that you can disagree with someone yet still be kind. Sadly we don't see so much of that in today's world. Thank you so much, Kay. And I agree--it is sad. I love when I read news stories about kindness, hoping it keeps spreading. 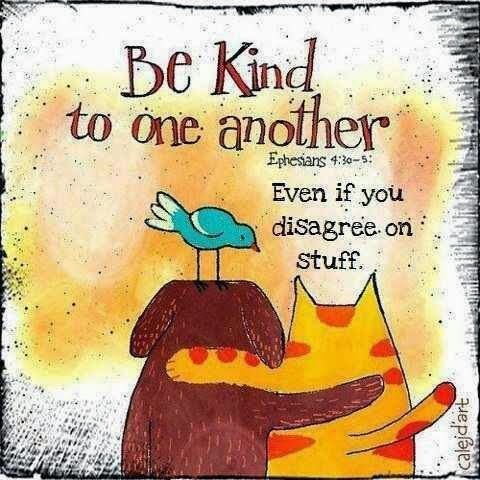 I agree with the photo that you shared above, its so important to be kind. Got your newsletter this morning. It was concise and informative. Congrats! Thanks, MaryBeth. Hope you love the new book. I welcome your newsletter. And I want my very own picture of Pepe. Your daughter has done a wonderful job. I wish someone would deliver to me! LOL. Someone on the post mentioned fried chicken and now I'm craving it. Thanks for stopping by! Got your newsletter this morning. It looks fantastic. I'm looking to reading One Potion in the Grave! Thank you so much, Sila! Your newsletter got through fine...thank you for the raffle. for whatever my problem. My favorite was the hot toddy for colds and upper respiratory issues! LOL. Looking forward to reading your Potion books!